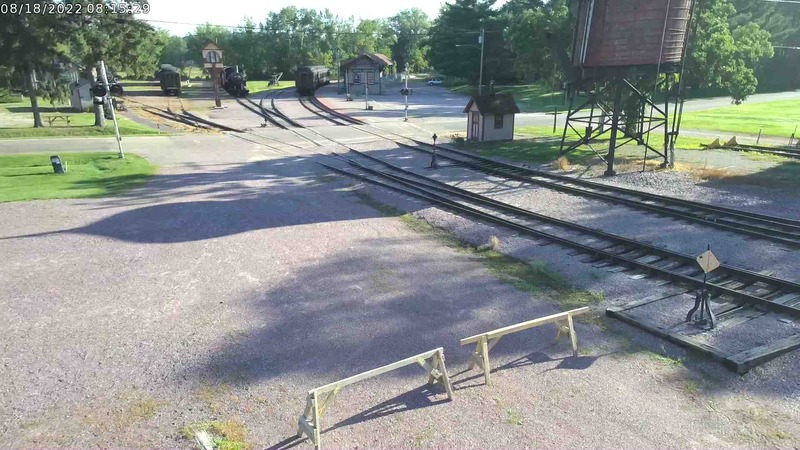 During the second week of March, SPEC Machine’s Steve Roudebush and Tyler Roudebush along with Brett Morley of Performance Engineering traveled to Tennessee Valley Railway Museum to meet with and assist Gary Bensman of Diversified Rail Services. Diversified Rail Services was contracted by Continental Fabricators to flange the four firebox sheets needed in building 1385’s new boiler. 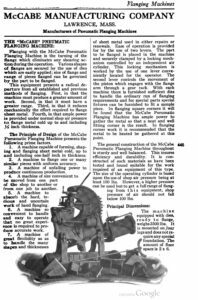 The McCabe Flanger in a 1921 American Society of Mechanical Engineers Catalogue and Directory. Flanging is a process to make a smooth bend in steel forms while the steel is cold. Flanging can also be done while the steel is hot but it adds more time, work and requires more people. 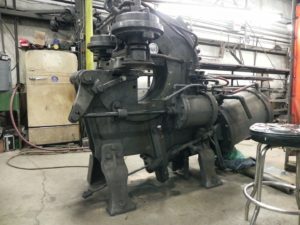 The choice of whether to use hot or cold flanging is made largely on the shape being bent and where on the sheet of steel the bend needs to be made. 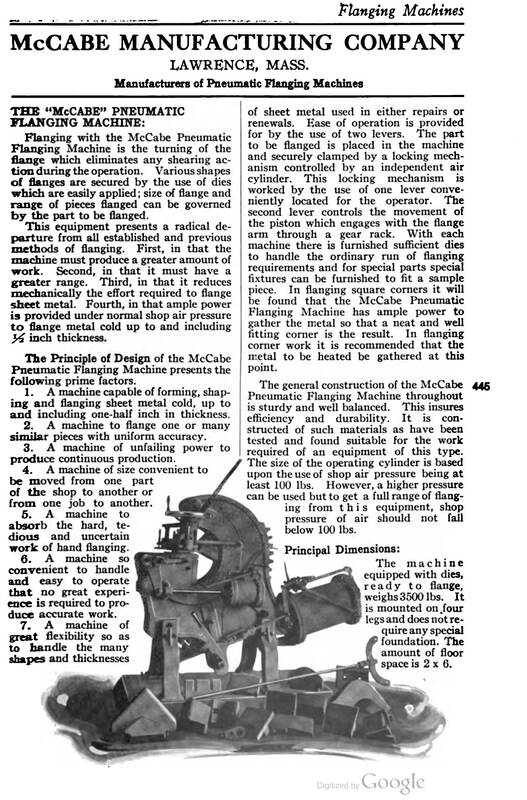 The machine seen in use here is a McCabe Flanger, a steam-era machine which uses pneumatic pressure for power. The bends are made a little at a time to prevent creating a wrinkle in the sheet. The accompanying photos show the the aforementioned persons along with formation of the 1385’s rear tube sheet. The tube sheet forms the front of the firebox, meaning one side will be exposed to intense fire and combustion gases while the other side will hold back a wall of water. Before being installed, the rear tube sheet will have holes drilled for and support nearly 200 2-inch fire tubes and 24 superheater flues. The tubes and flues go through the water space of the boiler to conduct the combustion gases from the firebox to the smokebox at the front of the locomotive and allow the water and steam time to absorb more heat from those gases. The tubes and flues also serve to help support the tube sheet. 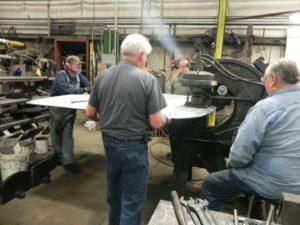 Since the sheet is a large, flat surface, steam pressure is constantly pushing on it, trying to bow the sheet, but the tubes and flues mechanically tie together the front and rear tube sheets, providing strength and holding the sheets flat. 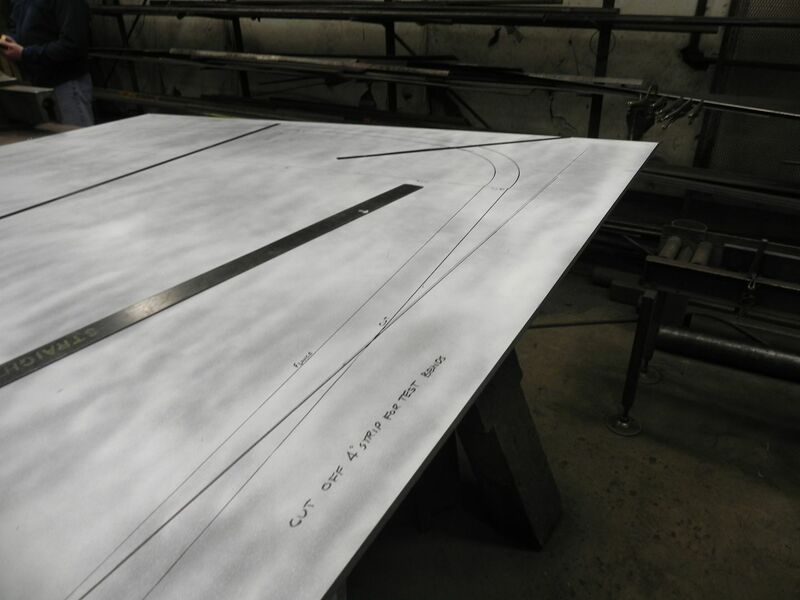 The metal sheet which will form the 1385’s rear tube sheet is carefully measured before any cutting or bending begins. Photo courtesy SPEC Machine. 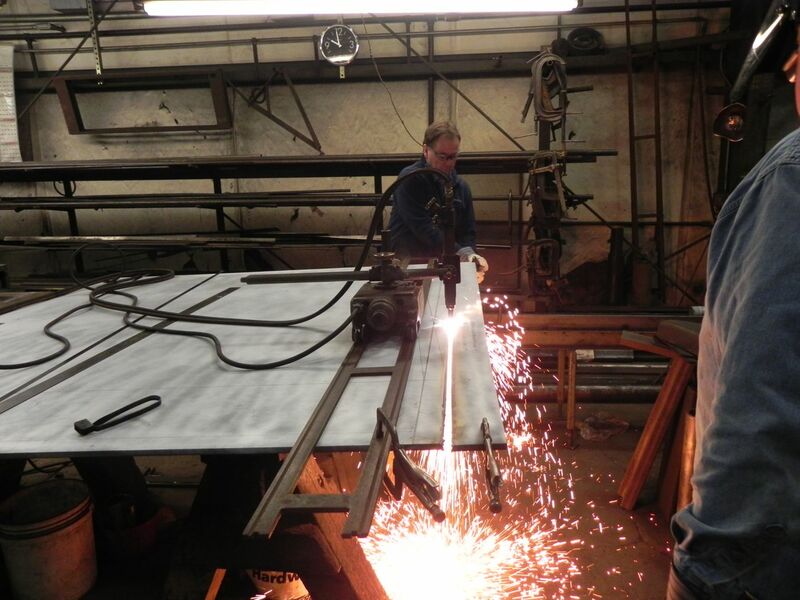 Excess material is removed from the rear tube sheet using a torch track. The self-propelled cutting torch gives a better cut over a long distance than can be achieved by hand. Photo courtesy SPEC Machine. 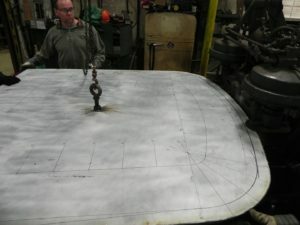 Gary Bensman carefully marks the locations and degree of the bends to be made. Photo courtesy SPEC Machine. 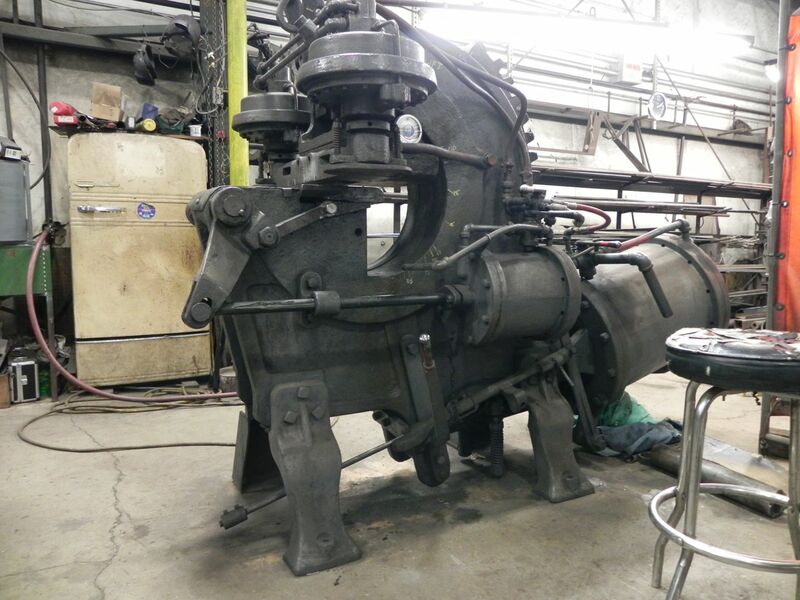 The McCabe Flanger machine at Tennessee Valley Railway Museum’s shop. Photo courtesy SPEC Machine. The rear tube sheet is marked up and ready for the flanger. Photo courtesy SPEC Machine. 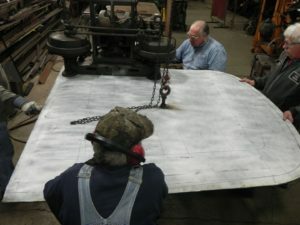 Crew members move the sheet into position. Photo courtesy SPEC Machine. Steam veterans Gary Bensman, operating the McCabe Flanger, and Al “Uncle Al” Phillips (left), are assisted by 1385 Team representatives Steve Roudebush and Brett Morley as the 1385’s rear tube sheet is positioned for flanging. 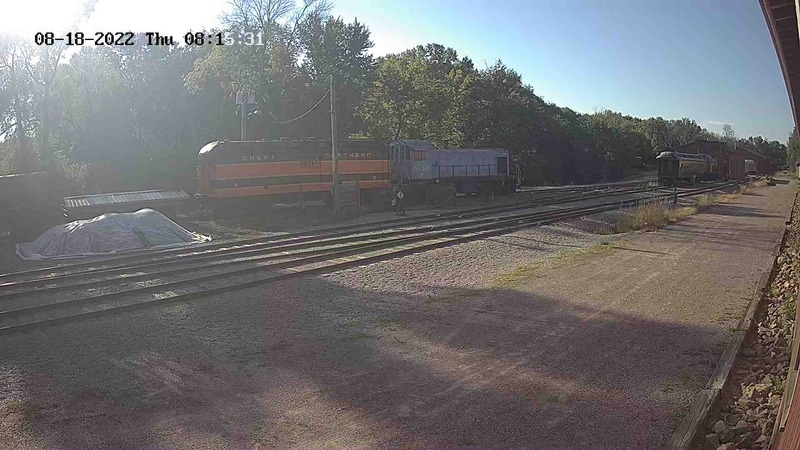 Photo courtesy SPEC Machine. A slight bend in the tube sheet is visible here after a turn through the McCabe Flanger. Photo courtesy SPEC Machine. 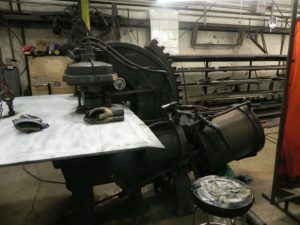 C&NW 1385’s new rear tube sheet takes shape. 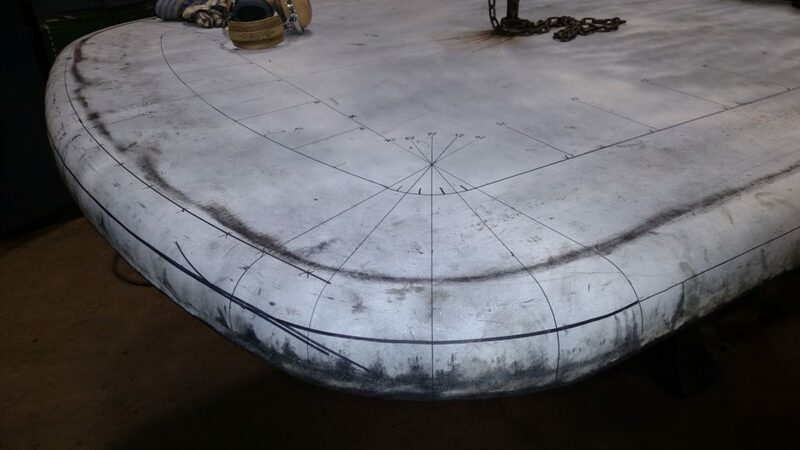 This is a view of a blend from a straight side to 12.5″ radius corner to 72″ radius crown sheet. Photo courtesy Gary Bensman. 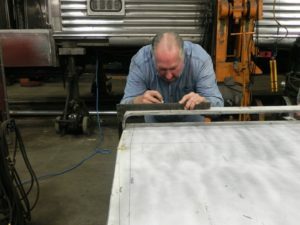 Mr. Bensman of Diversified Rail Services was contracted by Continental Fabricators to form the sheets for #1385’s firebox and tube sheets. Above video courtesy SPEC Machine.